Pours a hazy orange with hints of green glimmering in the light. The aroma includes pine, tropical fruit, and zesty citrus, especially grapefruit. Long, dry, bitter finish. A few months ago, Untappd started sending me monthly recaps of what I drank. I track a lot of beers, and now look forward to that email. It tells me my favorite style, the number of beers I drank, popular pictures I posted, and more. Last month, my favorite style was IPA. The month before it was stouts, which makes sense… it was the winter! Anyway, I am a hop head (self proclaimed) so I love a good IPA. Some, especially on Twitter, are calling this a double IPA. I mean, the beer packs 95 IBUs. That is BIG for an IPA. I can’t wait to see what this bad boy smells and tastes like. In the Glass: This is a good looking IPA. It has a thick, fleeting head and the lace just hangs on for dear life. Some of it just sticks to the side of the glass begging to be drank. When I swirl it around in the glass, which I do quite often with beer and wine, the head foams up and leaves a thin layer of frothy white on top. Let’s dig in. Nose: Whoa… that is a PUNCH of hops. I am pretty sure there is just a pile of hops sitting in the glass waiting to be enjoyed. Holy cow. I love hoppy beers, and when I read this had 95 IBUs I got excited… I guess that is what 95 IBUs smells like! Flavor: The flavor is NOT what I expected. When I pour n IPA, one that is often called a double IPA, I expect the hoppy nose… which I got. But I also expect some hops on the palate. I get those, don’t get me wrong. But I might as well have just sucked on a pine needle. I am not sure that is a bad thing, but the flavor is not as much hop as it is pine. The flavor is good, but again… not what I expected. Mouthfeel: The mouthfeel is good. The beer appears to be thick in the glass, but isn’t on the tongue. It slides down smooth, with a punch of hops and a hint of carbonation. I normally am not that big on bubbles, but lately I have been opening my mind to bubbles. The pine needles hit you about halfway back, and then it leads to a bitter, strong aftertaste. Aftertaste: The aftertaste is the best part. Well, the smell is the best part. But the aftertaste is nice. It sticks around for a while, and is somewhat dry with a hint of bitterness on the swallow. It has a professional finish… like an IPA that has been around the block a few times. The aftertaste has me longing for the last drop. This is a good beer. It doesn’t taste like it has 95 IBUs. It smells like it does, but doesn’t taste like it. I could just sit here and smell this all day long. I have never licked a Christmas tree, but I have a feeling it would taste like this beer. Like I said, that isn’t a bad thing. But just not what I expected. The burp is nice, though. Anyway, I am a BIG fan of IPAs, but this one is too outside the box, even for me. Well, Ricky and I completely disagree on this beer. Apparently it smells and tastes like one thing to him and another to me. Plus, I’m really not in a good mood before writing this… I’m trying to work on my website, and WordPress is just giving me all kinds of issues. Grr. Anyway…. The beer has… well, it pretty much has no smell at all to it, in my opinion. Even after practically burying my nose in the glass, I really get nothing from it. It looks kind of thick, and is pretty opaque in the glass. It’s kind of a burnt orange color. There is a lot of lace on the glass, however. Too bad that can’t make up for the lack of a smell. I like the thickness of the beer, but honestly that’s about all that impresses me. It’s hoppy… but then again, it’s an IPA, it’s supposed to be. And to me, this beer is pretty much all hops to me. I mean, I like a good IPA, but they all have that hoppy taste, and if there’s nothing to distinguish them, it gets pretty boring after a while. I know Ricky is a big IPA fan, and while I like them… they’re not my favorite and I think as the distinguishing factor, the hops easily tend to become the only thing you notice. This beer is pretty much proof of that. All in all, not a bad beer… if you like IPAs. If you don’t, or if you’re just ok with them… well, then this is just another IPA. 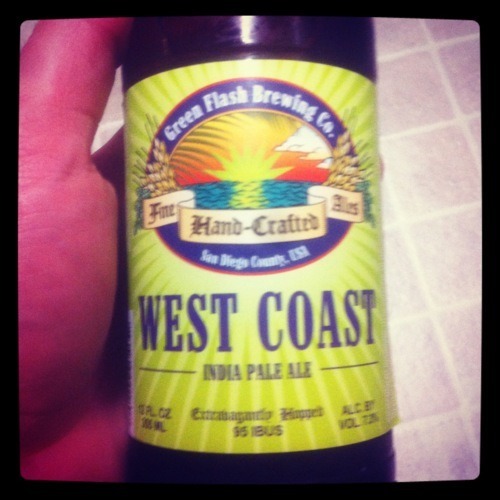 I probably wouldn’t buy it again – there are better IPAs out there. A thick, creamy, tan head and a rich, roasted aroma open this dark-as-night stout. There are also plenty of coffee and dark chocolate notes. A big, filling brew with a rich mouthfeel and some burned grain notes in the finish. Crisp and refreshing, it goes well with shellfish and roasted meats.